In this tutorial, you'll see the complete workflow for modeling a pup tent in a style that was popular during the 1800s in North America. 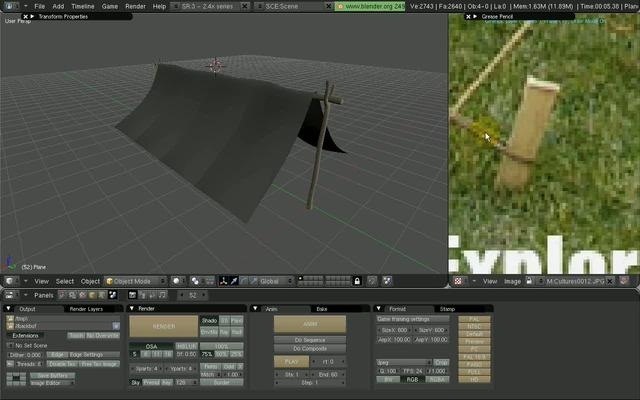 This is a two-part tutorial, and in this part one you'll see how to use the Cloth simulator for the tarp of the tent, and also how to create the framing, stakes, knots, and ropes. The second and final part of the Pup Tent tutorial looks at applying procedural textures for the different aspects of the tent and shows how to use a paint application to extract a background image for your scene. Back in Blender, you'll create a ground area and also use Blender's particles system to create grass. Finally, you'll create render layers and use Blender's compositing nodes to color correct things before doing a final render. Whether you're new to the Blender Foundation's popular 3D modeling program or a seasoned graphic artist just interested in better acquainting yourself with the application, you're sure to be well served by this free video tutorial. For more information, including detailed instructions, take a look!